Weekly Photo Challenge AND Bailey is a Finalist in a Photo Contest! First of all, I just learned that this photo of Bailey has been chosen as a Grand Prize Finalist in a photo contest! The winner is determined by popular vote which means that YOU can help Bailey win simply by clicking here and then hitting the “VOTE” button. I would REALLY appreciate it if you could take a few seconds to vote! Voting is open until August 16th and you can vote once per day. The contest is sponsored by Yakima Racks and the winner receives gifts from Ruffwear (Bailey’s favorite dog gear outfitter), Zukes (Bailey’s favorite treats!) and a $500 Yakima gift card! In other news, this week’s WordPress Weekly Photo Challenge is One Shot, Two Ways. The idea behind this challenge is to show the same subject from two angles and I have a fun example to share. 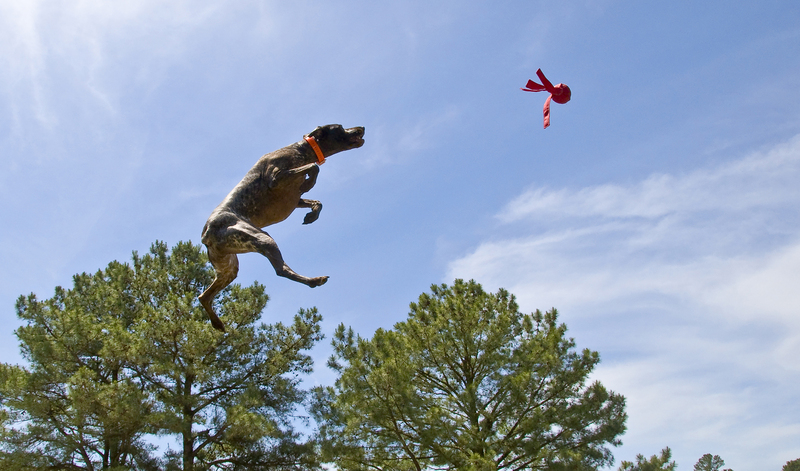 The following two photos show Bailey flying through the air about to catch her duck. 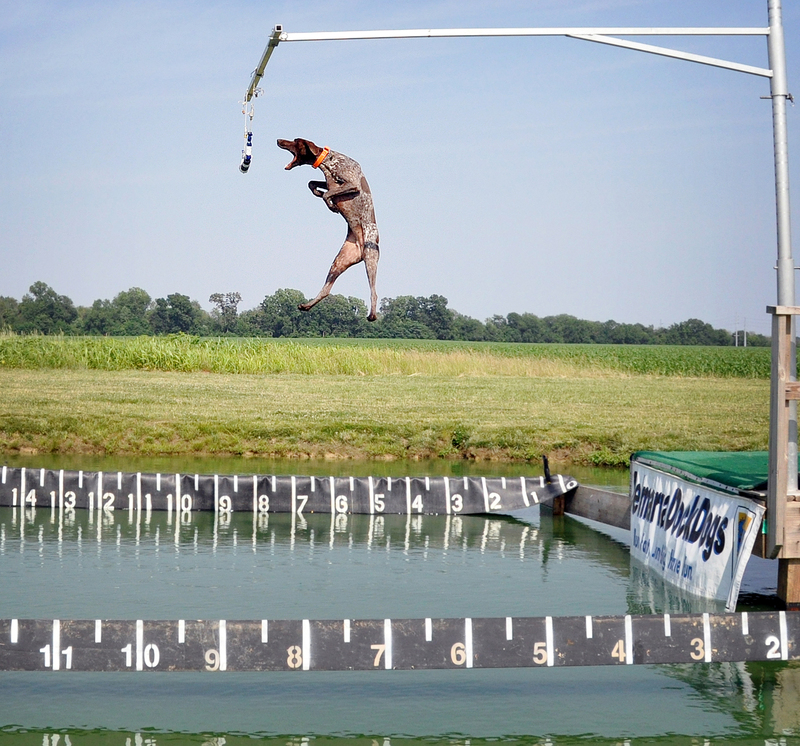 They were taken from two different cameras at the exact same moment during the same jump. Cool, right? The first photo was taken head-on by a professional photographer (Key4Prints). I happened to catch the second photo from the bleachers at the exact same time… just as Bailey was contorting her body and snapping her mouth open mid-air in an attempt to catch her duck. While the professional shot is clearly a better photo, I kind of like the second shot because it helps you appreciate what a huge jump this was. Bailey ended up winning her division at this event with a 24+ foot jump! Less than 72 hours after returning home from our St. Lucia honeymoon Matt and I packed up the Subaru and set out with Bailey to the WISP Resort in western Maryland for the 2013 DockDogs Eastern Regional Championships! If you’ve been following my blog for a while you may remember that last year at the 2012 Regional Championships Bailey earned an invitation to Worlds by placing 4th in the Elite Big Air division. Bailey didn’t do quite as well this year but we still had a blast!! 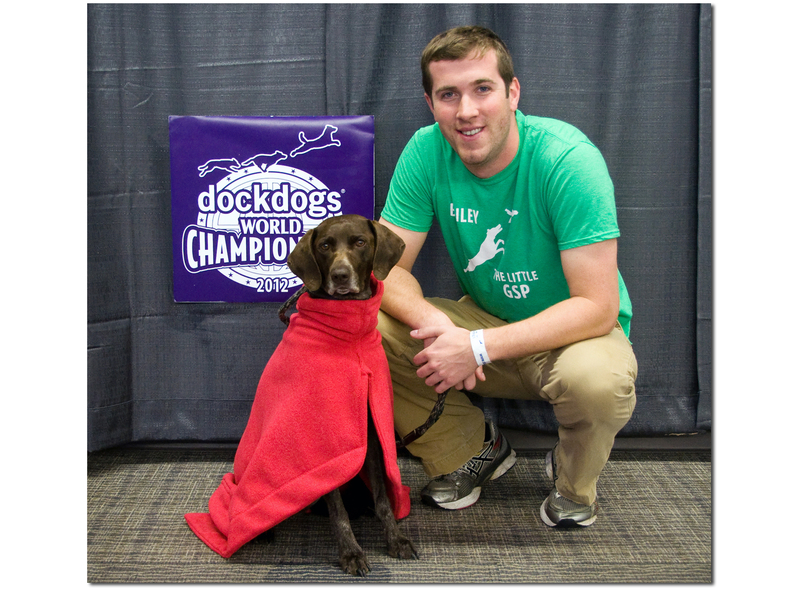 One of my favorite things about DockDogs events is that Matt and I get to spend quality time snuggling with Bailey. She is not allowed in our bed at home, but when we travel to pet-friendly hotels she sleeps with us and she makes herself very comfortable on our bed when we leave her alone in the room. We have an ongoing battle where we try to shield the pillows with blankets (because, as much as I love Bailey, it’s not my goal to sleep on a pillow that’s been nuzzled by a dog dipped in DockDogs pool water!) but, try as we might, Bailey always burrows her way under the blankets and we return to find her nestled in a luxurious doggie pillow nest. (It’s adorable.) I’ll have to try to get a photo of Bailey on the bed next time, but for now here are some other photos from the weekend! Bailey and her GSP friend, Flyer! Good times. Well, that’s about it for the event recap. Thanks for stopping by! This week’s WordPress Weekly Photo Challenge is “Up.” As you may have noticed, I love to use photos of Bailey whenever possible in these challenges and it just so happens that jumping UP is one of her favorite things to do! 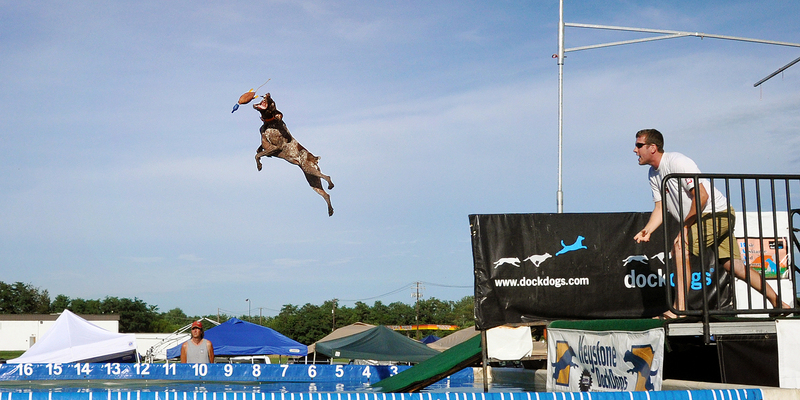 The first photo shows Bailey competing in Big Air at the Dock Daze event in May 2012 and the second photo was taken during the Extreme Vertical competition at the 2010 Delmarva Doggone Fun event. Bailey ended up winning with a height of 7 feet! 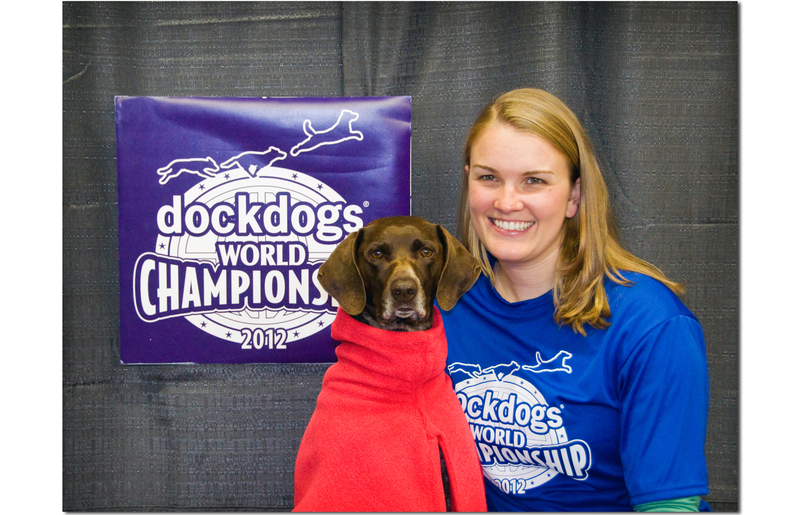 We had a BLAST at DockDogs World Championships!! This invite-only event was basically an awesome dog convention because throughout the weekend we found ourselves continuously bumping into old friends, catching glimpses (or elevator rides!) with reigning World Champions, and meeting new friends (and dogs!) that we’d only ever read about on Facebook. Cool! That’s me posing with Bailey. Check out her super-warm “Trover” jacket… it’s like a big red doggie robe! 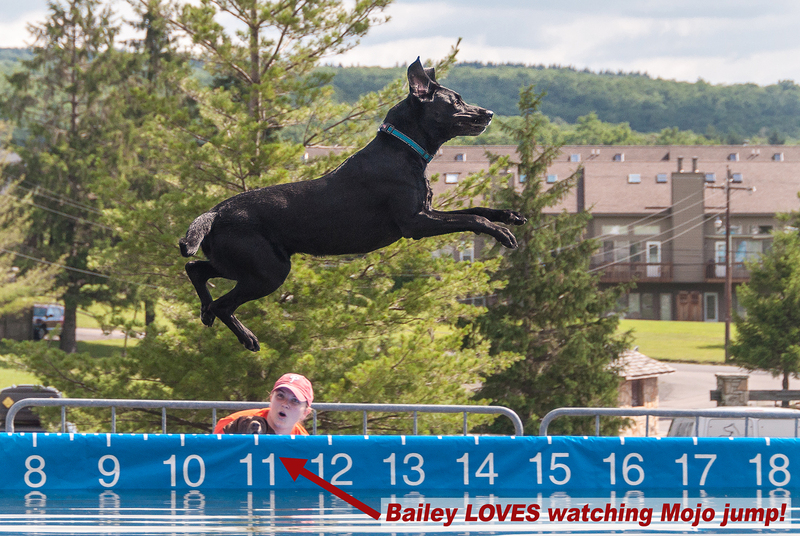 Much to our relief Bailey enthusiastically jumped during both of her qualifying rounds! We had been worried that she might decide that the water was a bit too chilly and embarrass us by stopping on the dock in front of the big crowds but luckily she brought her ‘A’ game and jumped without hesitation. She wasn’t actually competitive score-wise — 20’8″ was her longest jump — but we had fun nevertheless! Yeager actually broke his own indoor EV world record on Friday night with an 8’3″ grab. Yeager competes as part of GoTeam21, an organization that raises awareness for children with Down syndrome. You can check out Yeager online here: http://goteam21.org/. The long road trip to and from Dubuque, Iowa wasn’t as bad as I thought it would be. We stopped in Ohio for the night on the way out and made it to Dubuque for the official competitor check-in by Thursday afternoon. I wanted to go through as many states as possible so we made a slight detour into Michigan and then took a route that brought us through Wisconsin on our way into Iowa. Bailey has now visited 13 states! In order they are NJ, PA, DE, MD, NY, VA, OH, CT, IN, MI, IL, WI, IA (just in case you care…). 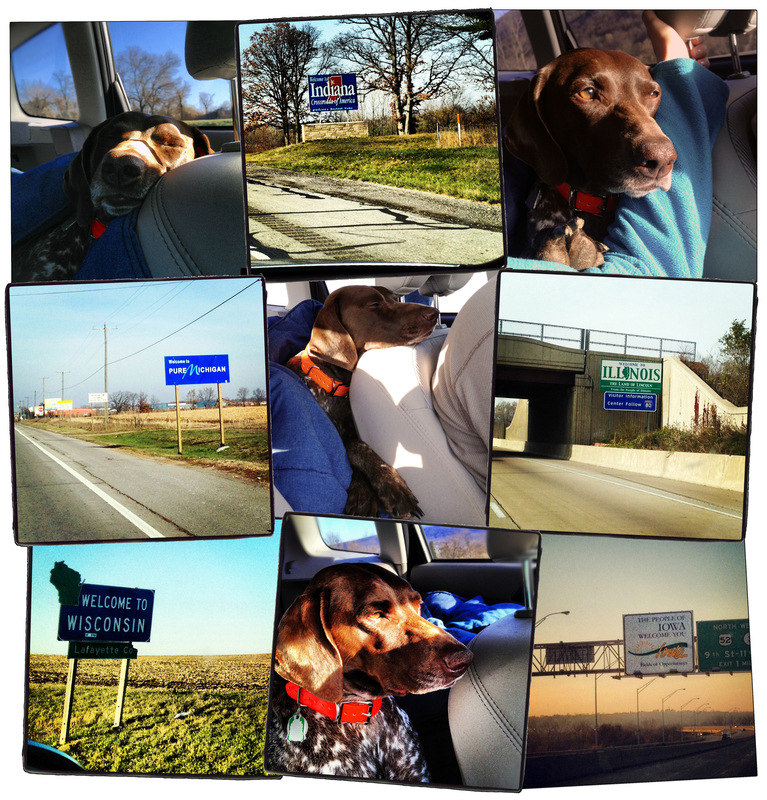 Matt handled Bailey AND did all of the driving on our 1895 mile round trip… nice work! I’m very thankful that we got a chance to compete at Worlds and we’re already looking forward to the start of the 2013 season next Spring! Congratulations to all of our friends that made finals (and a BIG congrats to Carlyn and Max from Chesapeake DockDogs for their Big Air Junior win!!) and I hope that everyone had safe trips home. 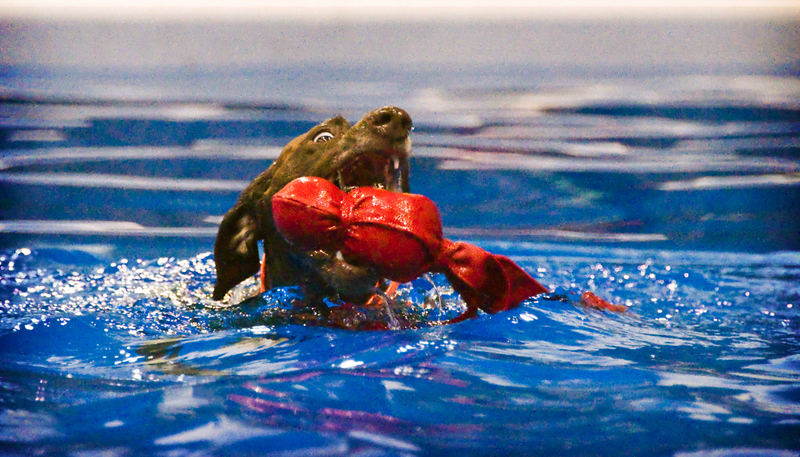 Preparing for DockDogs World Championships! 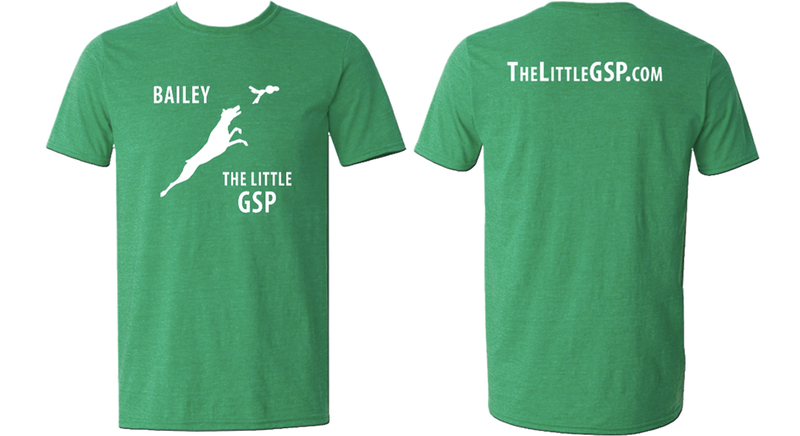 I also made “The Little GSP” shirts for Matt and myself to wear at the competition. I used a silhouette of Bailey jumping (it’s actually the same photo as the top left image on her trading card) and had these shirts printed at BlueCotton.com. The shirts are super soft and my Bailey shirt is quickly becoming my favorite t-shirt of all time! 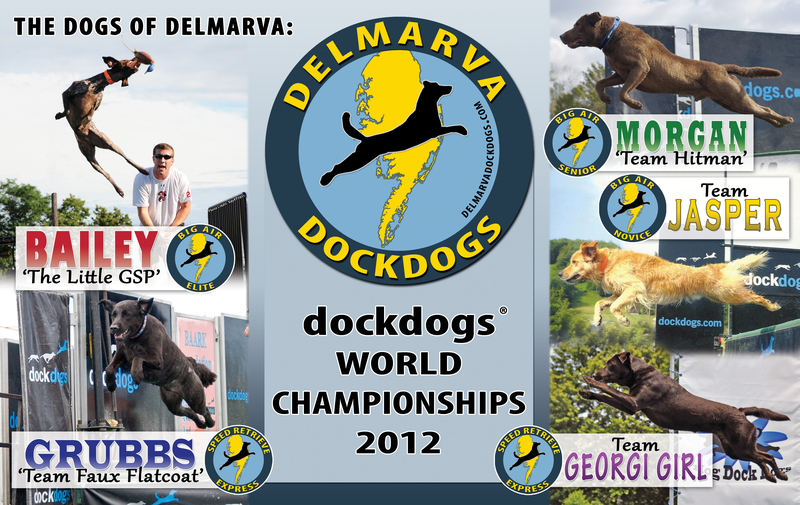 DockDogs is hosting a “window-tagging” contest (i.e. 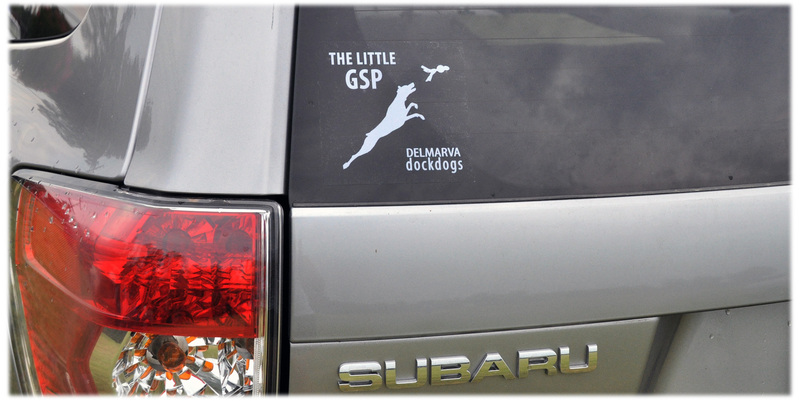 “DOCKDOGS WORLDS OR BUST” written all over the car windows) but we are skipping the window paint in favor of our Little GSP decal. I had our decal made at VistaPrint.com a few years ago. If you see a silver Subaru Forester driving down the highway with this decal (or ANY window-tagged DockDogs vehicle, for that matter!) please feel free to honk and wave! Last week I cautioned New Jersey to watch out for the Little GSP and it turns out I was right! Bailey had a fantastic weekend at the Ocean County Decoy and Gunning Show and came away with the top jump of the weekend and a big blue ribbon to show for her efforts. Everything about the weekend was great — huge crowds, perfect weather, lots of new competitors, and season-topping jumps from Bailey! Sunday Finals: 23'2" and 23'6"
Other highlights of the weekend included a brand new competitor — a yellow lab named Dexter — who started his first-ever Extreme Vertical competition at the opening height of 4'6" and ended up WINNING the discipline with a grab at 6'4" (a HUGE achievement for a new competitor!!) 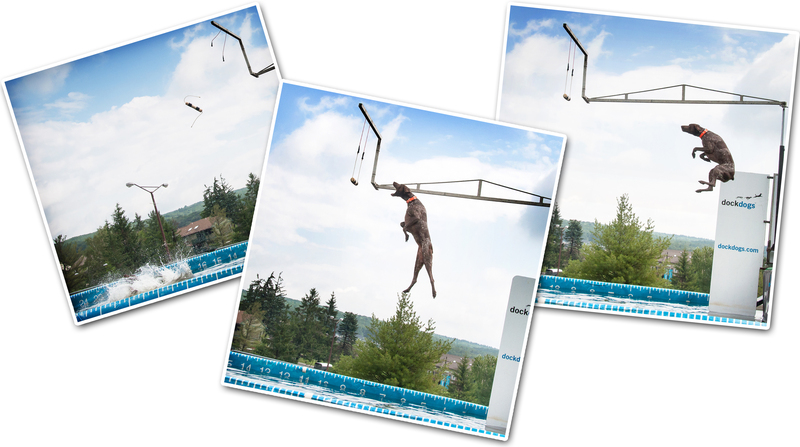 and also some beautiful elite-level jumps from our canine friends Mojo and Bosco. 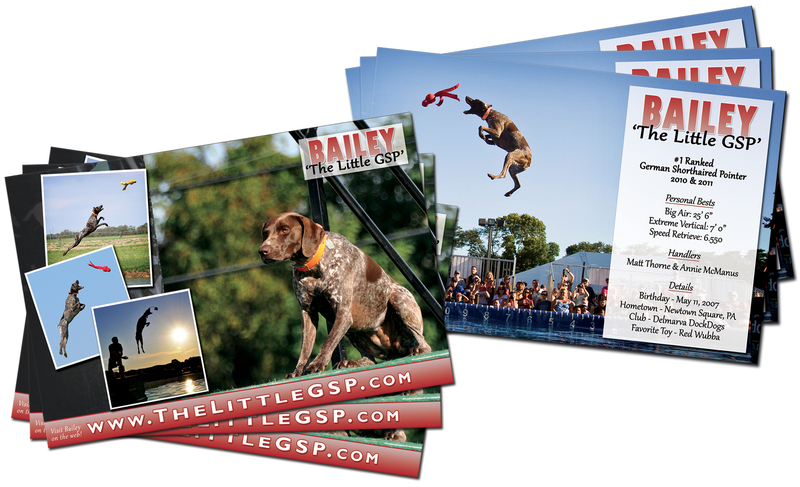 Off the dock, we got to meet the nice volunteers from the GSP Rescue of New Jersey and it was neat to get to tell them at the end of the weekend that Bailey had won the DockDogs big air competition! Maybe next year we can try to coordinate with them to get some GSPs that are in need of adoption on the DockDogs dock in front of the big crowds. Watch out Jersey, here we come! Next weekend Bailey, Matt and I will be joining Delmarva DockDogs for our second annual event at the Ocean County Decoy and Gunning Show in Tuckerton, New Jersey! 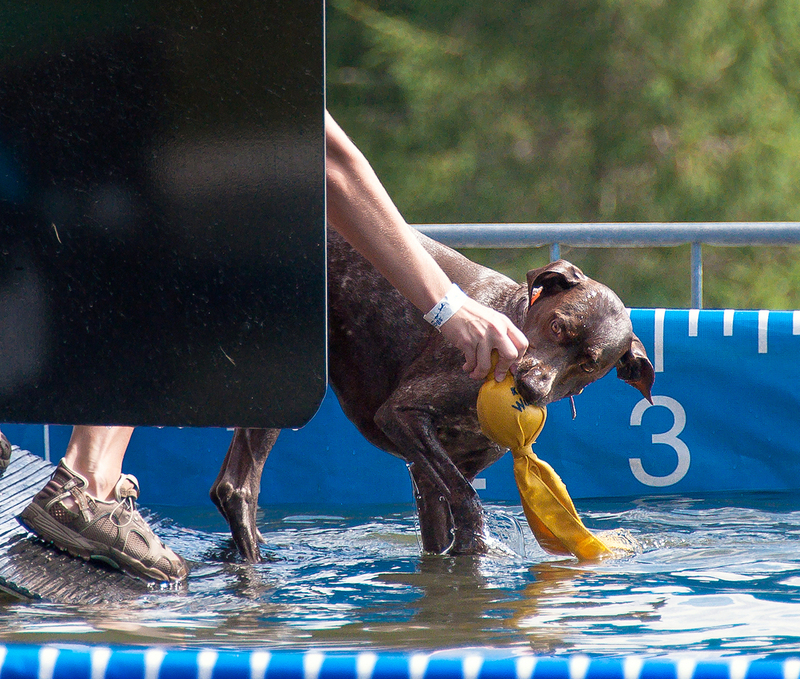 I loved this event last year because all of the spectators are waterfowl-hunting, outdoors-oriented, dog-loving people and there are hundreds of vendors who are catering to that crowd. For me, that makes this festival MUCH more fun to walk around than a big state fair with aisle after aisle of funnel cakes and ‘fresh squeezed’ lemonade (although those are nice, too..). 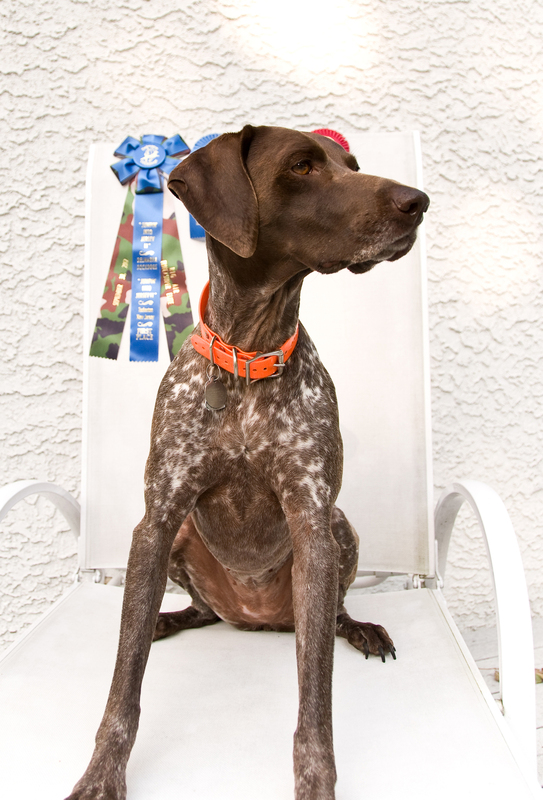 Last year we saw multiple German Shorthaired Pointers spectating with their owners which was really neat since GSP’s tend to be rather uncommon in the greater Philadelphia area. I’m hoping to meet even more GSPs this year! 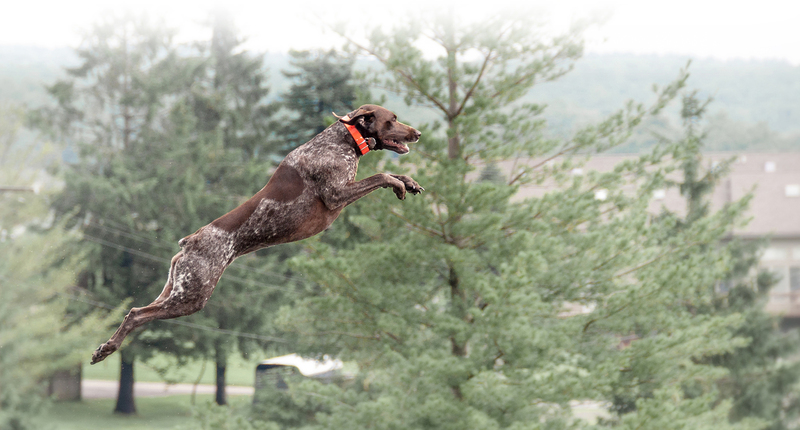 My favorite little GSP had a great time at Tuckerton last year, bringing home the blue ribbon in Extreme Vertical and a 2nd place in Big Air. 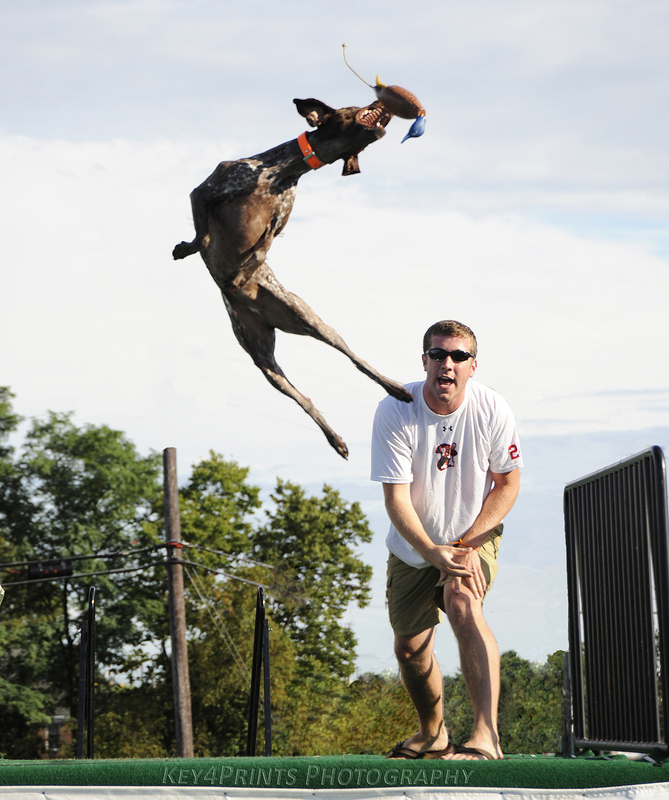 Hopefully the weather won’t be too crisp and fall-like this weekend or else she may decide that it’s too cold to jump!